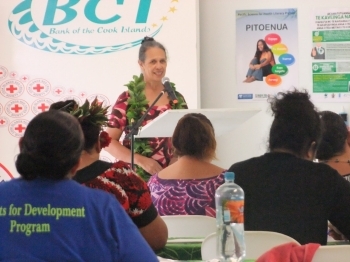 The Pacific Science for Health Literacy Project is a collaboration between the Ministries of Education and Health in the Cook Islands and Tonga, and the Liggins Institute of the University of Auckland, funded by NZAid in response to the high prevalence of non-communicable diseases in the Pacific. 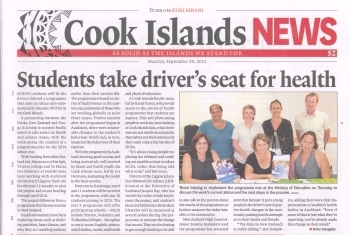 This news item appeared in the 30 September 2013 issue of the Cook Islands News; with permission. The Cook Islands is burdened with very high rates of obesity, and a related high prevalence of non-communicable disease (NCD) risk, morbidity and premature mortality. NCDs cause 74% of deaths in the Cook Islands, 36% of which occur prior to the age of 60. Adolescence is an important time when lifestyle patterns are being established and students are increasingly taking responsibility for their own health, nutrition and lifestyle, This is an optimal time for students to explore societal challenges such as obesity, type 2 diabetes, food security and non-communicable diseases (NCDs) and to evaluate their impacts on their communities. 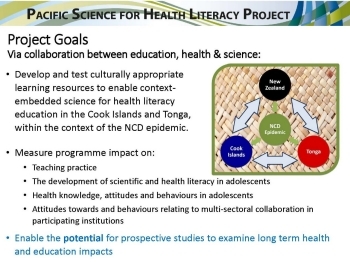 In 2012, the Cook Islands Ministry of Education, Tongan Ministries of Educations and Training, and Health, and the Liggins Institute of the University of Auckland formed a collaboration to develop a pilot programme that enabled students to gain a greater understanding of NCDs and related disease in their communities; this was funded by NZAid and became the Pacific Science for Health Literacy Project (PSHLP). Working together, the partners began to develop culturally relevant, student-focused programmes of professional learning and development (PLD) for teachers and learning modules for students to support life-long science and health literacy. In 2013 the project was launched in three high schools on Rarotonga – Tereora College, Titikaveka College and Nukutere College – along with three schools in Tonga. Over the 3 years of the NZAid grant, teachers and health professionals in the Cook Islands have worked together to build and develop a number of school-based programmes for teachers and students enabling young people to explore societal challenges and their environment across learning areas ranging from sciences and social sciences to English and health/PE. This pilot has resulted in the increased capability of teachers and adolescents to act as health promoters at school and home, and increased their access to and use of evidence to inform their decision making. Ina Herrmann opening the PSHLP Cook Islands future development workshop. In August 2016 a workshop was held to provide an opportunity for the team to share with the wider community what had been learnt through the pilot project and to collaboratively decide on the future of this school-science-health community partnership. More than 50 educators, health professionals, researchers and representatives of community organisations from Rarotonga and the Pā Enua (outer islands) of Aitutaki, Atiu and Mangaia and New Zealand attended this workshop in Rarotonga. The programme for the meeting can be viewed here. The clear consensus from the workshop was that the project should not only continue, but should be made accessible to a larger number of communities. It was also agreed that a proposal for further funding should be created and submitted to NZAid for consideration. From the discussions, a draft proposal focused on not only on school communities, but also expanded to include the health and agriculture communities was developed. A number of clear messages came from the meeting, including the importance to the community of having access to relevant data and evidence to explore from their own communities. It is anticipated that if the application is successful, the project will expand to Pā Enua (outer island) communities, firstly on Aitutaki, Atiu and Mangaia, and develop to respond to emerging evidence relating to key NCD risk factors such as fruit and vegetable consumption and physical inactivity patterns. PSHLP Cook Islands future development workshop, Day 2 of the meeting. The PSHLP programme has been underway in Rarotonga since 2013 and members of the team have been interviewed a number of times in the Cook Islands media. On the first day of the community consultation, Cook Islands Television (CITV) interviewed Project Leader Jacquie Bay, Karen Tairea of the Cook Islands Ministry of Health and Delaney Yaqona (one of the lead teachers in the project), Deputy Principal of Nukutere College. about the project. This is the video of the interview that aired on CITV on 2 August.